Aaron Craig of Stupidkrap is about to launch his first ever resin figure! Aaron’s infamous for making mashup pins and now one has transitioned into a resin figure. 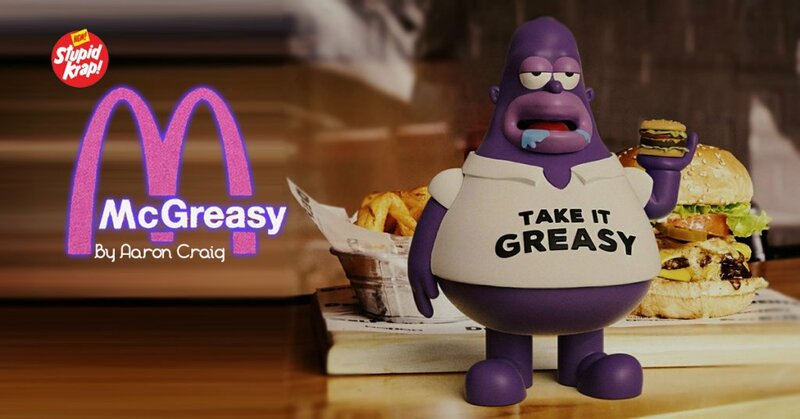 Meet McGreasy a mashup of Simpsons and McD’s, a body to die for (possibly modelled after our body shape, Ha) Who would have thought mashing up Homer and Mc D’s Grimace character? Looks cool right? Need that T-shirt for sure. McGreasy is now ready to be printed and produced! Powered by Evan Morgan of Model3D. No info about the scale and the alibility, but Aaron did say McGreasy will be released via Stupidkrap mailing list. Need some McGreasy NOW? Why not cop the Pin.